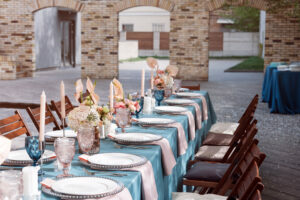 Cost should be the thing you consider first and foremost when picking a venue. This seems obvious. But, often times, event planners waste time with pie-in-the-sky dreams about what they would do with an event at a venue they can’t afford when they should be thinking about and working with, what they can afford. When budgeting for a venue it is essential that you do your research. Say, for example, you have a budget of roughly $200,000. Realistically, you’ll be looking at a venue spend of $50,000, but again, this depends on the size of your event, the guest lists, and other unique factors. For a wedding, a venue spend can be as high as 50-percent of a budget, while for a corporate meeting, 10-15-percent is more realistic. While it obviously depends on the specifics of each event, we recommend to budget 25-percent of the total for a great venue. Taking all of these details into account, research your venue options, try and discover similarly sized and priced venues and go from there! You’ve probably already considered this. If you’re throwing a local party, then you should try and make the event as close as possible to where your prospective attendees live and work. If you have a lot of people flying in from out of town, then host the event at a venue near the airport. That’s not to say that hosting an event somewhere far away doesn’t have its upsides. For particularly special events, having an event hosted in any amazing, location, such as New York City or Las Vegas can add an air of extravagance, importance, and excitement. These locations, when used sparingly, can make certain events can’t-miss destination events that your guests will anticipate for months – and talk about for years after! The critical thing to remember when selecting a venue location is the logistics. Consider how far your guests will have to travel, including the associated costs: airfare, hotels, transportation, and so forth. That is why events held far away should be reserved for those truly special occasions. Otherwise, closer to home is always the best bet. Even though you’ll be finding your venue early in the event planning process, you’ll still want to have a rough idea of what types of activities you’ll be offering, like photo booths, and plan the party’s layout accordingly. 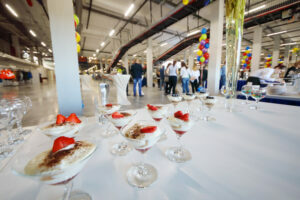 When deciding on the venue’s layout, you should also pay close attention to how the people attending your event will flow through the event space. By taking the time to consider the issues related to footfall and traffic flow, you can ensure that your guests are mingling where they should be and any jams are avoided. Pay special attention to the existing decor inside the venue. You’ll want the interior of your event’s venue to match the theme. While the traditional belief is that you can’t hold a gala in a warehouse nor an expo in a ballroom, nowadays, more and more people are swapping traditional events for the more Avante Garde. Just make sure the mood reflects the aims of your event and you don’t try to reinvent the wheel with any decor that’s too bizarre or potentially off putting. If you’re an event planner, the first thing you probably did after figuring out your budget is determine who will attend the event and how many people you’ll need to invite. 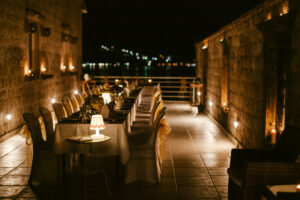 You’ll want to make sure that your venue can accommodate the expected guest list and is suitable for the audience size. If your venue is too big for your event, consider using a decorative partition to adjust the size of the event space. Also, note that if your event is invite-only, you should request that your attendees RSVP by clearly printing it on the invitation. While the exact amount of no-shows is obviously unique to each event, as a general rule of thumb, it’s best to assume that roughly 15 to 25-percent of guests invited may not RSVP. When we say that it’s important to know your target audience, that means gaining a deep understanding of their potential wants and needs. Your event’s demographics are vital to the selection of your event venue, the food, the entertainment, and everything in-between. If, for example, your audience is a group of high-ranking business executives, then your venue should reflect that. If your event is for a younger company with a start-up vibe, you want to keep it casual: street food chilled out music, that sort of thing. Always be sure to keep an eye on the weather and adjust your needs accordingly. If, for example, you’re organizing an event and rain is forecast, have umbrellas on-hand or tents available for anything outdoor. Be sure to keep in mind any local weather patterns as well. Don’t schedule an event in Miami in the middle of hurricane season, no matter how good the hotel deals look! This is an often overlooked part of throwing a great event. It’s not only concerts and massive parties that need security. Even upscale events can become targets for crashers, and who needs that? Get some security for your next event and give yourself peace of mind. You need all the necessary ramps, elevators, etc, in place to accommodate both the elderly and the disabled at your next event. If you need some help figuring out what this may require – don’t fret. The Americans with Disabilities Act website has a helpful guide on Making Temporary Events Accessible to People with Disabilities. Have any tips of your own? Leave a comment below.